A cat has been found injured after being caught in a Fenn trap that may have been set illegally. Animal welfare charity the Scottish SPCA is appealing for information after the female cat, named Mila, was found injured in Dornoch. 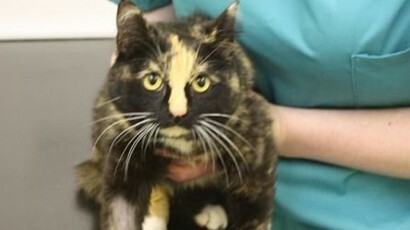 The cat had been missing rom her home on Ross Avenue for four days when she was found on Monday June 20. Scottish SPCA Chief Superintendent Mike Flynn said: “Mila’s owner discovered her in a neighbour’s garden with her left leg caught in the trap. “She was very dehydrated when she was found. We think she tried to make her way home after she was trapped and hid in a nearby garden. “Amazingly, Mila did not suffer any broken bones or serious injury. However, she was in a lot of pain and very distressed. “Her foot was very swollen and she has possible nerve damage so she is being cared for at a local vets. “Although the trap was legal, we think it may have been set illegally. It should have been fixed but clearly wasn’t if Mila managed to walk with the trap still attached to her leg. The Scottish SPCA backs an outright ban on snares and traps as they are indiscriminate in the animals they catch and cause a great deal of pain and suffering. 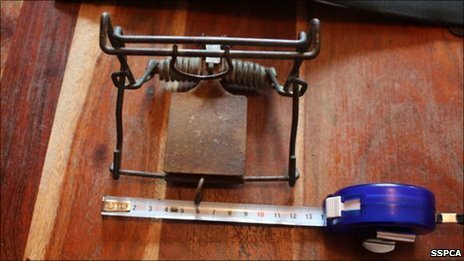 Setting illegal traps is an offence under the Wildlife and Countryside Act 1981 and causing an animal unnecessary suffering is a serious offence and anyone found guilty can face stiff penalties including a prison sentence and a fine of up to £20,000. Anyone with any information about the trap in Dornoch is asked to contact the Scottish SPCA’s animal helpline on 03000 999 999.